Regular vehicles in all area's of the UK. Looking for freight back into East Yorkshire or Scotland. 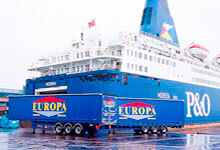 Since it's formation in 1993, Europa Shipping Services has established an impressive reputation for efficient and reliable transportation of dry freight. Formed initially as a freight forwarding company, we developed rapidly in both scope and resources, and today the company operates its own fleet of trailers from its new premises located conveniently close to Hull's Docks. Our success is based upon our professional and responsive approach to customer needs, and our determination to fulfil their requirements consistently. The company offers a personal service to every customer, regardless of the scale of their operations, and our high standards were confirmed by our ISO accreditation in 1998.